Kathryn Walker, RN, created Stepping Stool International to improve lives and break the cycle of poverty. Kathryn Walker, RN, has known adversity. But the experiences she survived as a teenager growing up during Liberia’s long and brutal civil war did not harden her—instead they helped form the critical care nurse who is known for her patience and unwavering calm. 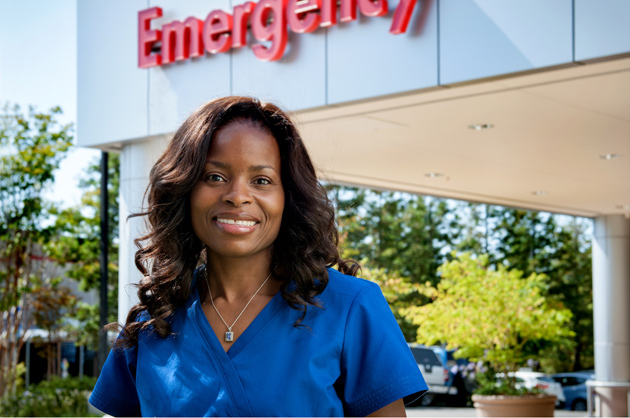 Walker moved to the United States in 1997 to study nursing, and began working on-call for the Emergency Department at Kaiser Permanente Santa Rosa in 2011. She has not forgotten the people of Liberia who are still suffering after the country’s 14-year civil war, and who today are reeling from the Ebola crisis that has killed thousands of people in West Africa. In 2012, Walker created the nonprofit, Stepping Stool International, with the ultimate goal of building an orphanage, school, and medical clinic near her former home in Monrovia. What inspired you to start Stepping Stool International? I went back to Liberia for my father’s funeral several years ago, and at the meal after the service there were many hungry kids nearby begging for food. So I fed them, and they were so grateful. I knew there was a big need in Liberia, and I started thinking about how I could help. I was restless for a while because I knew the problem was too big for me, but God laid it on my heart to do something. I don’t have a lot of money to do this work, but I do as much as I can, and I rely on God to do the rest. Kathryn Walker started a nonprofit with a goal of building an orphanage, school, and medical clinic in Monrovia. How did you begin to help? 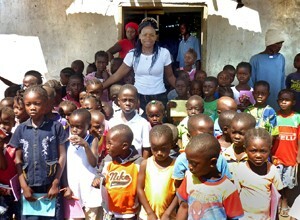 The first project was to bring school supplies for kids to a camp for displaced people near my former home in Liberia. They have a school that was in really bad shape. We made sure every student had a pencil and a composition book, and we donated a set of books for each class. I paid for those supplies myself. Since then we have been helping another school in the area with supplies and curriculum. I know that the cycle of poverty can only be broken by education, and for these kids, education is their hope. What has the Ebola crisis meant for your work in Liberia? With schools closed because of the Ebola virus, we have focused on sending food and supplies to the camp for displaced people. We’ve sent soap and Clorox because they don’t have the money to buy supplies to prevent the spread of the virus. I have a program manager in Liberia, and he has also led a couple of Ebola education sessions with a focus on teaching people how to stay safe. The crisis is really sad, and I wish I could do more. The need for our orphanage is even greater now. I was planning to start with 12 to 15 kids, but now we’ll need to plan for 20 to 30. There are obviously more who need help, but there are only so many I can take. Land was given to me by my family to build an orphanage, and I worked extra nursing shifts to pay for clearing the land. Everything was ready to build, and we were going to start raising money to build the orphanage when the Ebola crisis hit. How does your experience in Liberia affect your work at KP? Where I come from and what I’ve been through gives me a different perspective. It helps me to see each patient as an individual because I know everyone has their own story. Even if they come to the ED with something small—like a cut finger—they may have other things going on, and for them this is an emergency. My work in Africa with people who desperately need help has given me more patience, and it has given me the ability to care for everyone with compassion.